The TCP/IP family of protocols has become the de facto standard in the world of networking. Found in virtually all computer communication systems, they form the basis of today's Internet. 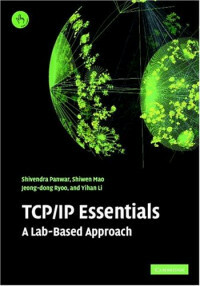 Including a series of carefully designed laboratory experiments that span the various elements of protocol definition and behavior, this book is a hands-on guide to TCP/IP technologies. The experiments are described in a Linux environment, with parallel notes on Solaris implementation. The book includes homework exercises, and supplementary material for instructors is available. It is aimed at electrical engineering and computer science students, and will also be valuable for engineers studying for networking certifications. TCP/IP Essentials is a hands-on guide to TCP/IP technologies, and shows how the protocols are implemented in practice. It contains a series of carefully designed laboratory experiments that span the various elements of protocol definition and behavior. The experiments are described in a Redhat Linux environment, with parallel notes on Solaris implementation. The book includes homework exercises, and supplementary material for instructors is available. It is aimed at electrical engineering and computer science students, and will also be an ideal guide for engineers studying for networking certifications. Shivendra S. Panwar is a Professor in the Electrical and Computer Engineering Department at Polytechnic University, Brookyln. He is currently the Director of the New York State Center for Advanced Technology in Telecommunications (CATT). He is the author of over 80 refereed papers. Shiwen Mao is a Research Associate in The Bradley Department of Electrical and Computer Engineering, Virginia Tech. Jeong-dong Ryoo is a senior member of staff at the Electronics and Telecommunications Research Institute, Daejon, South Korea. Yihan Lee is a PhD candidate in the Department of Electrical Engineering, Polytechnic University, Brooklyn. Windows Workflow Foundation is a ground-breaking addition to the core of the .NET Framework that allows you to orchestrate human and system interactions as a series of workflows that can be easily mapped, analyzed, adjusted, and implemented.